In order to add widgets to reports, click Add from the Top Toolbar, and select the desired widget from the menu. Meter - a gauge component that displays a single value. Meters display data in both Specific mode** and Aggregated mode*. For example, the "Page Views" Meter displays the number of page views for a site and all its sub sites. Chart - a graph component that displays data over time (trends). Charts display data in both "Specific" and "Aggregated" modes. For example, the "Page Views" Chart displays the number of page views for a site home page in the "Specific" series, and the number of page views for a site home page and all its sub sites in the "Aggregated" series. Table - a tabular component that displays a list of data. Tables display data in "Aggregated" mode. Each table row displays data in "Specific" mode. For example, the "Page Views" Table displays a list of items for a site and all its sub sites. The number of page views for each item is specific to that item URL. Map - a map component which displays geo data. * Displays the number of page views for a site and all its sub sites. ** Displays the number of page views for a site home page in the specified series. Once a widget has been added to a report, widget preferences can be set as well. The Preferences dialog can be opened by double clicking the title of the widget or by clicking Report Actions and selecting Edit. Filter – setting the filters for the data. Appearance – setting the visual appearance of the data. Group By – setting the various groupings of the data and the data series (available for charts which support multiple series). Advanced – setting advanced options. 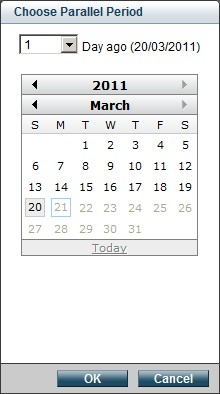 The date range includes constant values and a Customize… option. 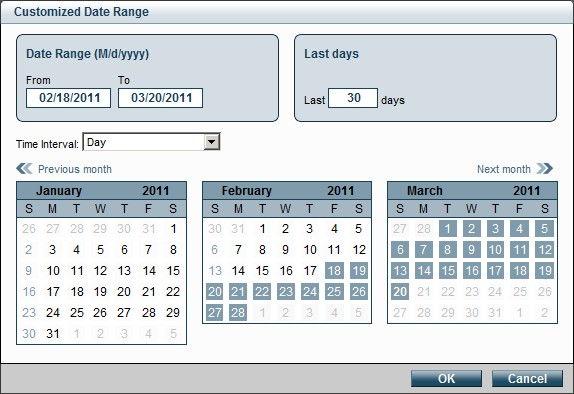 The Customize Date Range dialog displays two date selection options: calendar date selection and last X number of days. The Time Interval drop down list defines the intervals for displaying the data. Add and remove objects by double clicking on the specific object, or by selecting an object and clicking the Add, Remove buttons. When selecting an object, the report data will be displayed for the selected item as well as all children items (its sub items) in Object Explorer. To search for an object in Object Explorer, enter the object display name in the top text box and then click Search. 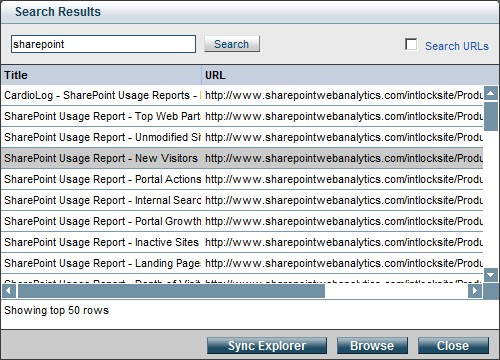 In the Search Results dialog, choose the desired item, and click the Sync Explorer button. The selected item will be displayed in Object Explorer.. 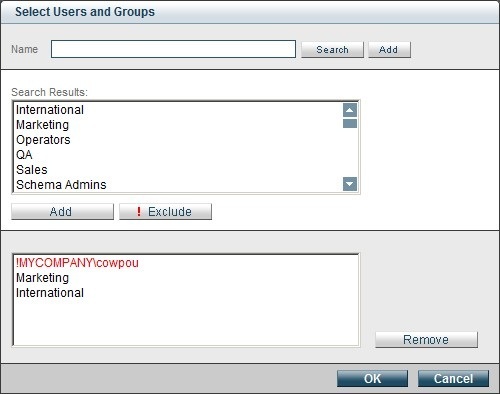 Determine Active Directory users and groups by selecting the Customize option. Enter a login account name or display name in the Name field and then click Search. Select the desired result and click the Add button to add it to the filter. To exclude a user or group, click the Exclude button (the name will appear in red). Filters are given precedence to users over groups. For instance, if a selected user A belongs to an excluded group B, then user A will be contained in the results data. Determine visitor segments by selecting the Customize option. Pre-defined Segments - Filter reports by pre-defined segments based on traffic sources (including shorten links and campaigns), country or goal. For more information see "Visitor Segments". Campaign - Campaign name. Describes the campaign, for example the campaign slogan or promotion. Source – Where the campaign is originating from. It can be the website name, the newsletter name or search engine. Medium - Campaign type, such as a banner ad, a click ad or email campaign. Term, Content – Campaign description. For example, for a banner ad campaign, you can use the Term field to specify the size of the banner (250x250, skyscraper etc.) or the placement of the banner (header, sidebar, popup etc.). The Content field can hold the creative type or the content of the ad. Goal - Filter reports by Goals. For more information see "How to create Goals". Country - Filter reports by country. CardioLog uses internal and third-party data to retrieve visitors' geographic locations from their IP addresses. Active User Categories - Filter reports by Active Directory attributes and SharePoint User Profiles such as Office, Department, Location etc. For more information see "How to configure visitor segmentation for authenticated users". Set the visual appearance of the data displayed in charts. Display the X axis title (the title is entered in the Title text box). Display the Y axis title (the title is entered in the Title text box). Insert a stripe across the plotting area of a chart to denote a break in continuity between the high and low values on a value axis. Use a scale break to display two distinct ranges in the same chart area. Time Interval – the time axis can be displayed in a resolution of minutes, hours, days, weeks, months, and quarters. Dimension – grouping according to the type of items reported. This option is available only for widgets that support advanced grouping. 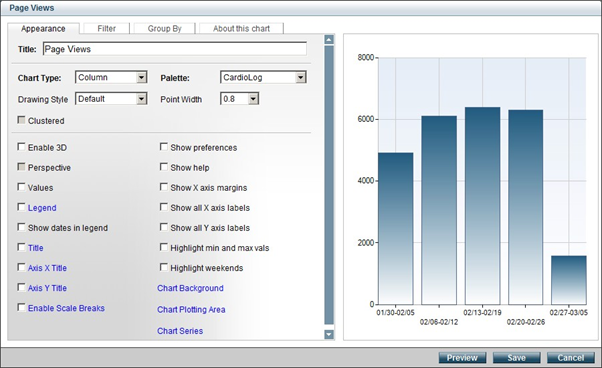 Chart widgets display multiple series of data. You can re-order the series’ data points, edit their title and compare parallel date ranges. Home Page ("Specific" mode) - data for the selected Website Item home page. All Pages ("Aggregated" mode) – data for all children items of a selected Website Item. This section is available for widgets of type meter. You can display data in widgets of type meter in different modes in the Advanced section. Home Page ("Specific" mode) - in order to display data for the selected Website Item home page select All Pages > No. All Pages ("Aggregated" mode) – in order to display data for all children items of a selected Website Item select All Pages > Yes. You can configure KPI alerts by selecting Send Alert in the Meter Preferences section. An Email alert will be sent to the report recipients when the meter value is lower than the undershoot or higher than the overshoot. In order to configure the report recipients see "How to create a distribution list for a report". After setting the widget’s preferences, the data can be viewed without saving the preferences (Preview) or with saving the preferences (Save). Drag and Drop the widgets to change their placement in the report. The help section displays the widget’s preferences and includes a brief description regarding the widget’s features. To open the Help section, click the help icon at the top right hand side of the widget. Use the top Preferences pane to apply similar filters for all widgets in a report. When using this pane, all individual preferences for the widgets in the report are over-written. If the widgets in the report use different filter settings, an alert will be displayed in the Preferences pane. Note: Due to the fact that the widgets use different filter sets (for instance, some widgets filter Website Item by URL, while others filter Website Item by items in Object Explorer), the filter settings in the Preferences pane will be applied only for widgets containing the selected filters. For enhanced performance and quick loading, widgets are displayed in cached mode while being edited in an existing report. Widgets in cached mode display old data and are presented with a white filter layer. To view current data for a widget, click Refresh. To refresh data for all widgets in an edited report, click the Refresh button in the Top Toolbar. This Hour - shows cached data until the last rounded minute. This Day - shows cached data until the last rounded hour. This Week - shows cached data until last rounded hour. This Month - shows cached data until last rounded day. This Quarter - shows cached data until last rounded day. Widgets of table type provide drilldown capabilities for selected items. Report drilldown is available from the site collection level to a single document, and for specific users and user categories. To view reports for an item, click the item and select the desired report template. To create a new template for drilldown, see "How to create a Template".